To Sum It Up: Since her arrival from the future, Prenna James has been trying to hide the fact that she’s from another time. She and her fellow travelers live by a strict set of rules in order to keep their origin undetected, but Prenna finds herself questioning them more and more, something that is not tolerated by the leaders of her community. She also worries that Ethan, one of her classmates, knows that there’s something different about her. As Prenna tries to unravel the secrets she believes are being kept from the time travelers, she must also race to stop a potentially future-altering event from happening, with only a date for a clue. 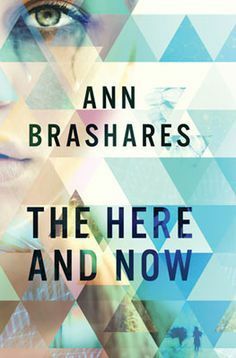 Review: Have you ever read a book and afterwards thought, “What did I just read?” Well, that’s how I’m feeling about The Here and Now. Although time travel features prominently in the novel, it also covers climate change, a plague, and a murder. How do all of these things fit together? The book tries to explain just that but isn’t entirely successful at molding these disparate pieces into a cohesive plot. Prenna, the protagonist, is part of a group of time travelers who escaped a world ravaged by a blood plague by journeying to the past. They do their best to blend in with what they call the “time natives” and follow a rigid set of rules to avoid drawing attention to the fact that they’re not from the present day. The community has a cult-like vibe to it, and questioning leadership is a big no-no. The lengths that those in charge go to in order to maintain control over the community is mind-boggling in more than one sense and involves an elaborate scheme with pills, eyeglasses, and surveillance. Again, we have a rather odd combination of items, and their relationship, as explained by the book, asked me to stretch my imagination to an extent that I couldn’t always manage. I’m all for books that span multiple genres, but I thought this one attempted to work in too many. The future Prenna comes from sounds like something straight out of a dystopian, and I wanted that world to be more fully explained. Something else that I found lacking in the explanation department was how the travelers made the jump back in time. If the book had gone a little sci-fi there, I wouldn’t have minded. We also have a mystery to solve regarding a date that might prevent the future Prenna and the others left. Finally, the YA contemporary romance angle is represented by the mutual attraction between Prenna and Ethan, a classmate with a very keen sense of observation. There are several threads to this story, and they’re not exactly woven together seamlessly. It’s as though the book couldn’t figure out what direction it wanted to go in, and I couldn’t figure that out, either. Prenna didn’t bowl me over as a main character. I really liked that she was through accepting whatever yarn the community leaders spun and started digging for the truth. What I didn’t like was how she’d freeze up in critical situations; when she should have been taking action, she’s kind of just go with the flow. By far my favorite character was Ethan; he’s smart, funny, and sweet and the type of character who’s easy to connect with. He brightened every scene he was in, and I’m bumping up the rating by half a star because of him. Otherwise, this was a rather disappointing read that struggled to find its footing. The ending actually made me fume for a little while and I debated knocking off half a star, but my fondness for Ethan won out. All in All: I haven’t read many time travel novels and had been looking forward to this one. Sadly, The Here and Now fell short of my expectations; it contained some good ideas but they needed to be better integrated into a whole. I struggled quite a bit with the book being all over the place. I was definitely curious about how the time travel was possible, and the passing references to the mechanics behind it weren't enough for me. It makes me feel good that I didn't request for this in NetGalley. First off, I don't like time travelling, next as you didn't like it, I'm sure that I wouldn't too. I don't mind time travel as long as it makes sense, but in this case it just never really got explained. I did, however, read an awesome adult book in which the time travel was woven into the story extremely well- The River of No Return by Bee Ridgway. It just came out in paperback, and I snagged myself a copy. I love that this book looks at a scenario that if time travel is possible in the future, why we wouldn't know about it now, but too bad it added so much extra stuff. I'd be really disappointed by the lack of explanation for the time travel aspect too! It was rather frustrating because I think if the book had delved into its sci-fi side a little more, it would have made for a much stronger story. I was really curious about how the travelers were able to manage their trip back to the past in the first place, but that's something that doesn't get a lot of page time. This was a pretty short book, but I felt like it took me forever to get through it because I was often puzzled. It sounded like such a great plot, too, which was why I grabbed it. And yep, the plot certainly felt like it was all over the place!